Would you like to grow your own magic mushrooms quickly and easily? We have a fantastic selection of shroom grow kits (small, medium and XL - in a variety of types) that enable you to grow shrooms from spores. Avalon Magic Plants is also a great place to pick up spore syringes, spore bottles and all the other accessories you need to grow magic mushrooms. When you start growing mushrooms, it is essential that you have the right materials. We provide ready-to-use shroom grow kits that contain everything you need for growing magic mushrooms. This grow kit is perfect if you don’t have any experience growing shrooms. If you know what you are doing, then the separate components from our grow kits may be of interest to you. 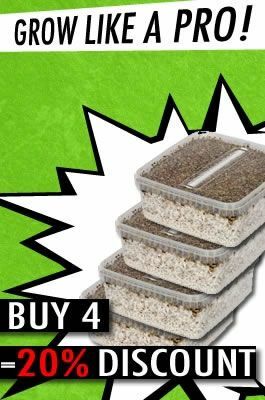 These include small or large grow dishes, new filter bags and various items for growing magic mushrooms. New spore syringes are also quite useful. These are used to grow magic mushrooms from sprouts in growing dishes. Buying or owning grow kits is not prohibited in the Netherlands but selling shrooms is. In short, it is legal to grow your own magic mushrooms, so it is also legal to be in possession of grow kits. Dutch law addresses “mushrooms”, which is why all kinds of shrooms are still for sale. These are primarily truffles, which do not involve the use of fruiting bodies from the mushroom. Those are the parts that are specifically prohibited. How does growing shrooms work? Our main tip is to always read the instructions thoroughly before you begin growing magic mushrooms. Our complete grow kits are provided with instructions, so that you can take your time and read exactly what you need to do beforehand. If you don’t know how to grow shrooms, you won’t know how to enjoy them the right way either! If you still have questions, you can always contact our customer service department.